On the occasion of the haute couture week, Label’Emotion had the opportunity to attend the fashion show of the stylist Xuan-Thu Nguyen at the Nikki Diana Marquardt Gallery. This young designer has a style of her own that draws inspiration from her different roots. Indeed, of Vietnamese origin, she is a migre in the Netherlands, finally settling in Paris. We met again in her small workshop in the 2nd arrondissement where we could meet her team and dazzle me with pieces from her collection. Through our exchanges, I understand that the luxury of her pieces lie in the perfect mix between craftsmanship and the aerial beauty of her creations. Each of her unique and original achievements. This rising star of the world of fashion makes a noteworthy passage during the week of fashion in Paris. Her projects … a new collection in September and the customized wedding dress design! So, when two equally passionate universes meet, it is impossible to circumvent each other. Label ‘Emotion is proud that its image is associated with that of Xuan Paris. I create from what I see. My creations are a reflection of what I feel internally. I work with a wonderful and talented hatter here in Paris. Our fabrics come from Japan, Italy, France or England. I work mainly with noble materials such as silk or cotton. But of course, I also work with blends. We have our own workshop here in Paris, where we make most of the complicated and handmade pieces. What sets me apart is the fact that I create what I feel and always try to improve techniques or cuts, or change the traditional way of using materials, to use them in a new way, The way of an artisan. Life is the greatest that one can have. It is a continuous path of development and change. What colors and fabrics do you like? I like off-white because it shows all the details of technique, cutting or your manual work. And because it’s the mix of all colors. What do you think is the definition of luxury? For me luxury means “quality”, durable, renewable and how you adopt it when you wear a garment. It is a matter of comfort and how happy one feels. How long have you worked on this creation? With all the seams and flowers I would say 3 weeks with several other people. Quel est son concept traditionnel ? What materials / fabrics did you use? How many meters of fabric is needed? How many people worked on this achievement? There was talk of creating a dress with layers, different layers, disorganized but perfectly balanced. And the eccentricity of a symmetrical length. What is his traditional concept? 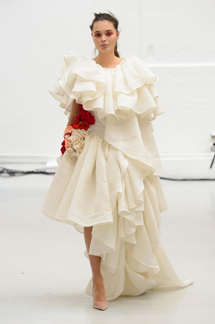 I wanted to put femininity in a blouse that could be combined with pants to have a contrast between something masculine and romantic with the ruffles. 10 meters for the blouse, all hand sewn. We worked with two people on this particular look. The idea was that romance and femininity envelop you like a cloud. The ruffles are of different lengths and shapes, and are very dense so that you have the impression of a hug. Ruffles (straight up?) With a long tail on the side. The back is simple and has ruffles. Silk and organza for the ruffles and for the silk, polyester and satin dress. Sometimes romance and emotions are accompanied by many turbulent feelings, excitement. I translated this into a high density of flywheels but in a light way, using light silk, organza and having a disorganized and unbalanced ruffles disposition always in a light manner. What attracts you in creating custom wedding dress? I like to create something with the bride. Ultimately, it’s her dress, she’ll wear it. I am there only to direct her in her choices and make her as beautiful as possible. The brides come to see me because there is already something that attracts them in the models or my ideas. Then we create something together! Ultimately, it is only the bride and her dress. What would be the starting budget for one of our future brides? It depends on what the bride is looking for. We always find a solution or a budget that suits the bride. Where can we see your creations? We have our workshop here in Paris, where we meet our customers and where we create our models.